In 1887 the Seattle, Lake Shore & Eastern Railroad was up and running, a line now followed by the Burke-Gilman Trail. The railroad paralleled streetcar lines from downtown Seattle as far as Fremont which was a major transportation hub for people to continue on to residential districts like Green Lake. The SLS&E Railroad was mainly for industrial use, so it travelled eastward to the sawmill village of Yesler (Laurelhurst) and then north along the shore of Lake Washington past various freight stops. The ultimate goal of the railroad was the coal fields near Gilman (Issaquah) east of Seattle, as well as carrying loads of bricks and lumber from the stops along the way. With the coming of the railroad and the ability to send and receive goods to and from downtown Seattle, businesses, mail stops and villages sprang up along the route of the SLS&E. In 1884 before the coming of the SLS&E Railroad, Osborn M. Merritt from Pontiac, Michigan, bought land on the shore of Lake Washington at about NE 75th Street. There were two streams, one at about 75th and the other at about NE 80th, which emptied into a little bay. The Merritts set up a shingle mill which they named the Pontiac Shingle Company. There was no electric power yet, so it is possible that the mill, which had a circular saw blade used to split logs into shingles, was water-powered. Water could be channeled into a chute and dropped onto a mill wheel whose turning would then power the saw blade. Whether Pontiac Shingle Company used water or steam power for their machinery, the location on the bay with its streams probably was a pleasant place to live. But it was very isolated because there was no road to Seattle, so products had to travel via boat on Lake Washington. 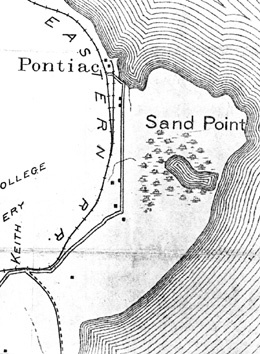 Detail from McKee’s Correct Road Map of 1894, showing Pontiac Bay near Sand Point on the railroad line. Map courtesy of the Seattle Room, Seattle Public Library. By about the same time that the SLS&E Railroad was completed along the shoreline in 1887-1888, carpenter Edward F. Lee had set up a shipyard at Pontiac Bay, and he built boats to be used on Lake Washington. In 1891 the brick company location was listed in the directory at the Pontiac stop on the line, and maps made in the 1890s showed the rail stop and the name of the bay as Pontiac. Biographical records for Judge Thomas Burke show that, prior to 1889, he was planning to build a brick office building in downtown Seattle, and this was probably why he was interested in developing his own supply of brick from Pontiac. Seattle’s Great Fire of June 6, 1889 created an enormous demand for brick for rebuilding, so the Pontiac Brick & Tile Company went into overdrive and a cluster of workers and families began living around the brick plant. There was enough going on there at the lakefront to justify the establishment of the Pontiac Post Office on January 18, 1890, with one of the brick company workers as distributor of the mail. Shipbuilder Edward F. Lee became postmaster in 1892 and did this job, plus his shipyard work, until 1909. The restless Doheny brothers, Joseph and Jerry, were born in Buffalo, New York of Irish immigrant parents. In their early twenties the brothers moved to Oakland, California, and on the census of 1880 in Oakland they were listed as merchants of a dry goods business. “Dry goods” meant a store which sold household items but not food. Some dry goods stores eventually began to specialize in clothing. The Doheny household in Oakland, California was a large one, because although the brothers were unmarried, they were living with their extended family group: their widowed mother; one unmarried sister Ellen; married sister Mary, her husband Thomas Marum and their child; and Thomas’ sister Julia. Jerry Doheny in his menswear store, downtown Seattle. The Washington Territorial Census taken between April to June 1889 recorded that Joseph Doheny and the Thomas Marum family had moved to Seattle, after living only about seven years in Walla Walla. Events of the year 1889 caused the entire clan to regroup in Seattle after the city’s Great Fire of June 6th. Like many others, the Dohenys and Thomas Marum must have concluded that Seattle, in its heroic rebuilding program post-fire, would provide the best business growth environment. Jerry brought his new wife Charlotte from Walla Walla and they spent the rest of their lives in Seattle. Jerry became a well-known member of the community, active in civic projects. In July 1889 Doheny & Marum advertised in the Daily Intelligencer newspaper in Seattle for their first store at Second & Seneca Streets (see photo of the ad at the end of this article.) In 1890 Doheny & Marum moved to the then-new Colman Building which still stands today at 811 First Avenue (between Columbia and Marion Streets.) By 1905 when the cartoon at right appeared in Argus magazine, Jerry’s store specialized in menswear and was called Doheny’s Cloak & Suit Store. Ever-restless, opportunity-seeking brother Joseph Doheny did not join in with the dry goods business with Jerry Doheny and Thomas Marum in 1889. Joseph went to work for the National Bank of Commerce which was one of the financiers of business growth in Seattle after the Fire. It appears that Joseph caught the real estate fever which many people got in the first years after the Fire: a burning desire to buy up property which they thought would increase in value as the city expanded. In other articles on this blog, it was seen that individuals such as Mary Chandler and Charles H. Baker invested in land in Wedgwood in 1890 which never became profitable. The Seattle business and rebuilding boom after the Fire did not extend out as far as Wedgwood, and because of another economic recession beginning in 1893, house lots in Wedgwood did not sell. 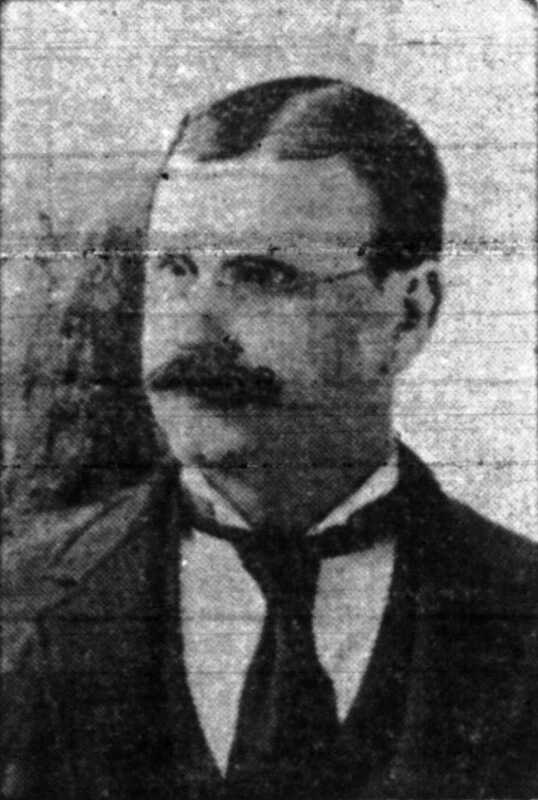 Robert R. Spencer was a banker and early car enthusiast in Seattle. Argus cartoon of 1906. Joseph Doheny worked closely with R.R. Spencer, one of the officers of the National Bank of Commerce. In 1890 Spencer bought the east-of-35th Ave NE portion of the land that Charles H. Baker had in Wedgwood, the Oneida Gardens plat. Spencer re-platted Oneida Gardens into smaller, house-size lots instead of Baker’s original five-acre “garden tracts.” The plat notation was that Joseph Doheny brought the Oneida Gardens Replat paperwork into the King County auditor’s office to be filed. Joseph Doheny then launched out to acquire land and plat it himself. Taking his inspiration from the nearest occupied community in northeast Seattle, Pontiac on Lake Washington, in August 1890 Doheny filed a Pontiac Addition in today’s Wedgwood. The Pontiac plat is from the corner of 35th Ave NE and NE 85th Street (present site of Rite-Aid) up to NE 95th Street, and from 35th to 40th Avenues NE. 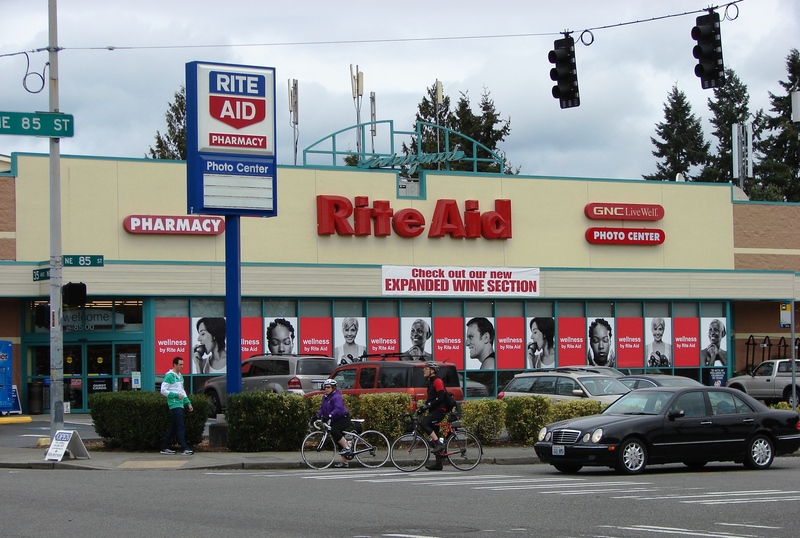 RiteAid is in the Pontiac plat, at the busy intersection of NE 85th Street and 35th Ave NE in the heart of Wedgwood’s business district. To name the streets in the plat, Joseph Doheny continued with the Indian-name theme, since Pontiac was an Indian chief of the Great Lakes in Michigan. Doheny gave the name Huron to today’s NE 88th Street, and continued northward with streets Chippewa, Erie, Mohawk, Eagle and Seneca (NE 93rd Street.) Some of the streets were given names with New York references, such as Albany for NE 85th Street and Niagara Ave for 38th Ave NE. Another plat by Joseph Doheny was contiguous with Pontiac on the east, but extending only from NE 88th (Huron) to NE 90th (Erie) and from 40th to 45th Avenues NE. The name of this plat, also filed in 1890, is Manhattan Heights, again with Charles H. Baker as surveyor. The Manhattan Heights plat filed in 1890 by Joseph Doheny was only “on paper.” He never sold any lots in the development. 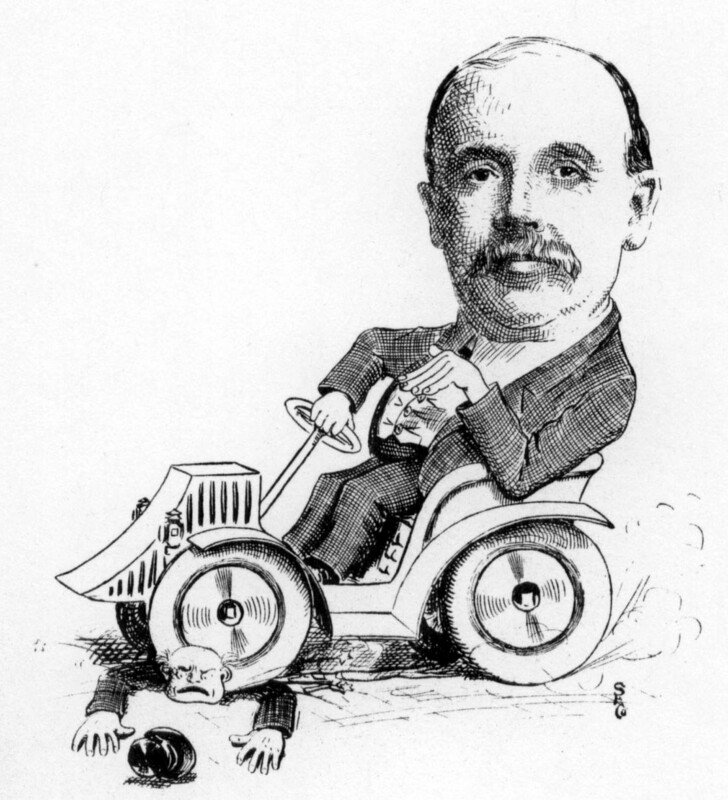 Charles Baker shown in an Argus magazine cartoon, sitting on Snoqualmie Falls and holding the electric lines of a streetcar. In his land survey work for Judge Thomas Burke and the SLS&E Railroad at Snoqualmie Falls, Charles H. Baker had not been impressed with the beauty of the Falls but instead had regarded it as a waste of water which could better be harnessed to produce hydroelectric power. We all do love electricity, so we can be thankful that Baker found a way to build a power generator without destroying the natural beauty of Snoqualmie Falls. By laying a straight grid of house lots over the Maple Creek Ravine in the (future) Wedgwood, Baker the surveyor was again expressing his pragmatism. We don’t know what would have happened if he and Joseph Doheny had really tried to develop the Maple Creek Ravine area into house lots. Bulldozers had not yet been invented, so the men were unlikely to fill in the ravine but it is hard to say what they would have done if they had actually sold lots. Many years of economic stresses intervened and the Maple Creek Ravine had no houses in it until Dr. & Mrs. Philip Rogers began to conserve the area in the 1930s. Property tax records show that as of 1891 not one lot had sold in the Pontiac or Manhattan Heights Additions in the future Wedgwood neighborhood. This was due to its remoteness, lack of roads and inconvenience of living there with no access to resources such as water. Economic conditions got worse when a national recession, called the Panic of 1893, caused people to pull back from real estate investments. As of 1895, the pages of the tax assessment rolls for the Pontiac Addition were marked “certificate of delinquency” because no one had paid the property taxes, and most of the lots in the plat were later sold at auction by King County. Joseph Doheny was no longer in Seattle by that time. Like many others who lost their fortunes in the economic downturn of 1893, Doheny left town. He went back to live in San Francisco and he engaged in business there. It is not known exactly why Joseph Doheny didn’t stay in Seattle with the rest of his family. We can speculate that he left town because he had debts and couldn’t pay, because we see from King County tax assessors records that the taxes on his Pontiac plat, were going unpaid. Joseph was 37 years old in 1893 and still had not been successful in business, so he may have felt humiliated by his over-extension into plats in the remote Wedgwood area. Perhaps Joseph just didn’t want to ask his younger brother Jerry to give him a job at the menswear store. Because of a combination of economic forces at that time in Seattle history, the Wedgwood neighborhood remained uninhabited and was left to much later development. If it had developed as Joseph Doheny had hoped in the 1890s, perhaps the neighborhood would have become known as Pontiac or Manhattan Heights. The prequel to this story: The landowner prior to Joseph Doheney was Marshall Blinn in 1870. He did not do any development of the site as it was only a speculative land investment. About Those King County Place Names, by Doug Cardle, 1989. R979.777 Ninth floor history desk reference, Seattle Public Library/downtown. Bureau of Land Management: Land Patent (cash purchase) of eighty acres by Osborn M. Merritt, December 1884 in Township 25, Section 2. Census (territorial and federal): Ancestry.com and Washington Digital Archives. City directories: available on the 9th & 10th floors, downtown Seattle Public Library. Judge Thomas Burke was an attorney, real estate investor and civic activist in Seattle. 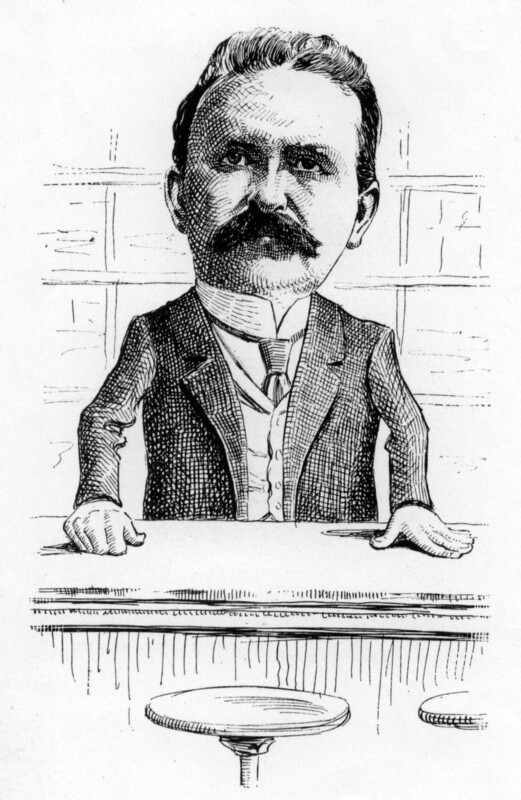 Argus magazine cartoon of 1906. He Built Seattle: A Biography of Judge Thomas Burke, by Robert C. Nesbit, 1961. B918N, Seattle Public Library. Thomas Burke came to Seattle in 1875 at age 25. In addition to his work as an attorney, Burke became wealthy through real estate investment. He never bought land in “outlying areas;” he only bought land which was already in the Seattle downtown core or had water access, such as in Ballard. He was one of the organizers of the SLS&E Railroad and he invested in other businesses such as the Pontiac Brick & Tile Company. Pontiac was an “outlying area” but he knew it would successfully send its products to market because it was on the line of the SLS&E. #2217 Pontiac Brick and Tile Co.; #2306 Lee Shipyard; #2487 Sand Point: The Early Years; #3280 Pontiac Post Office. “Once Prominent Business Man of Seattle Passes Away at San Francisco.” Seattle Post-Intelligencer, September 23, 1905, page 16. Joseph died at age 49; his brother Jerry lived in Seattle until his death at age 77 in 1935. King County property records: looking up an address on the Parcel Viewer will show the property description and name of the plat; there is a link to see the original plat map. The oldest plat filings in Wedgwood, like Pontiac in the period of 1888 to 1892, have street names instead of numbers (for example, Huron for NE 88th Street.) However, no one actually lived in Wedgwood in that era. The street plans were only on paper and had not been put through. McKee’s Correct Road Map of Seattle and Vicinity, Washington, USA, 1894. SEAMAP G4284.S4 Seattle Room, Seattle Public Library. Men Behind the Seattle Spirit: The Argus Cartoons, 1906. RB.O Ar38M, Seattle Room, Seattle Public Library. Property ownership records: Original tax assessment rolls of King County, Puget Sound Regional Archives, Bellevue, WA. Doheny & Marum advertised their store in the Daily Intelligencer newspaper on July 21, 1889, just six weeks after the Great Seattle Fire. This entry was posted in Maple Creek ravine, name of the neighborhood, Plat names and tagged Judge Thomas Burke, McKee's map of 1894, Neighborhood History, Pontiac Bay Lake Washington, Sand Point neighborhood in Seattle, Seattle, SLS&E Railroad. Bookmark the permalink.